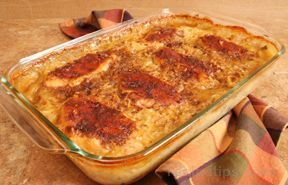 Baked in a savory cream sauce, this chicken and rice combination is rich in flavor and moist in texture. 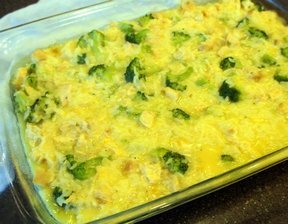 Lightly coat the entire inside of the baking dish. In a large bowl, combine the three cans of soup with the chicken broth and rice. Stir until blended. Spread this mixture in the bottom of the baking dish. 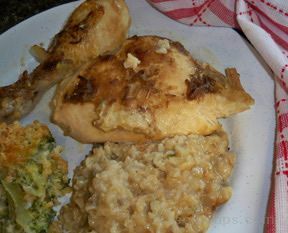 Place raw chicken on top of the rice. 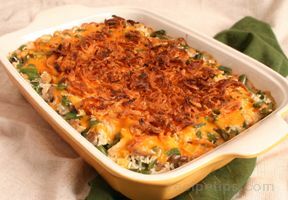 Sprinkle dried onion soup mix over top of the entire casserole. Cover tightly with foil and bake for one hour. Uncover and bake an additional hour. Tip: Spray the underside surface of the foil with cooking spray before covering the casserole to prevent it from sticking to the food.